The Kitchen Compost Pail with Carbon Filter is a unique and environmentally friendly holiday present for nature-loving individuals on your list. 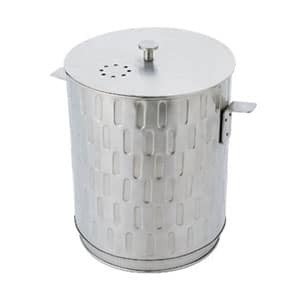 This silver compost pail with carbon filters will allow your loved ones to save kitchen scraps and convert them into compost for use in their gardens. This stylish, eye-catching apparatus will surely give your loved ones home a pleasant smell due to the carbon filter that is designed to absorb the odors that develop from the wastes being thrown to the pail. Simply toss organic kitchen scrap into the pail as needed. When the pail is full, dump the matter into a composter to make effective fertilizer for vegetables and other plants. Purchase this unique Kitchen Compost Pail with Carbon Filter today, and your loved ones can begin the composting process right away in their own kitchen!